The Global Times, which has repeatedly emphasized that any attempt by the United States to sideline China in its relationship with North Korea would fail, accused American media of being too concerned with whether China would benefit from any warming ties between North Korea and the United States. 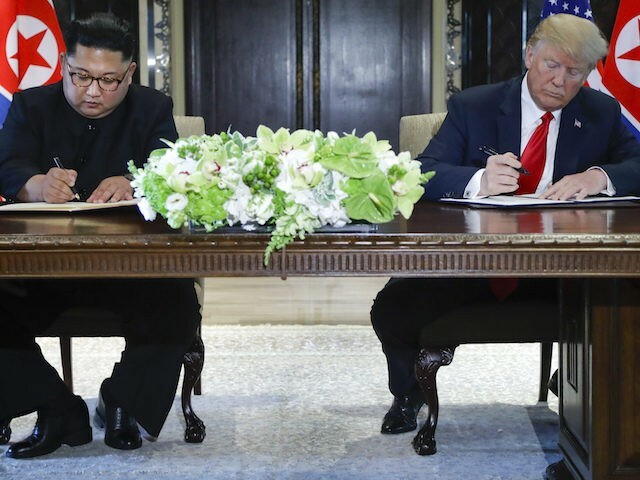 “The complete, verifiable, and irreversible denuclearization of North Korea that the US sought, instead turned out to be a vague four-point joint statement with no timetable or roadmap,” the Global Times said in a piece Thursday. It appeared to indicate that American mainstream media outlets believed this but issued this conclusion without affixing it to the opinion of any American source in particular. “The viewpoint that China is the biggest winner of the summit shares the same spirit. Apparently, it is only logical for the US to benefit at the expense of others. Why can’t the result of the summit be a bonus for China?” the piece asks. After the disintegration of the former Soviet Union and the dissolution of the Warsaw Pact military alliance, the US has no rival in terms of military capability. Yet it still expanded NATO and strengthened its alliance with Japan and South Korea. A vital part of its strategy is aimed at Beijing. Without being able to “fabricate a credible threat,” Washington cannot justify its presence in Asia, the Global Times concludes. It also once again gives China complete credit for the summit. “Without China’s endeavor, today’s achievements on the peninsula could hardly be reached. US media failed to realize that China – a ballast of regional peace and stability – gaining benefit is favorable to regional development,” the newspaper asserts. China remains a significant national security concern in the region, if not directly on the Korean peninsula. China has moved to colonize much of the South China Sea, including territory belonging to Vietnam, Brunei, Taiwan, Malaysia, and the Philippines. On Friday, the People’s Liberation Army held aerial drills to test its military drones in the South China Sea, shortly after reinstalling missiles illegally positioned in the region. The test follows a visit to Beijing by U.S. Secretary of State Mike Pompeo, his first since assuming the position of top diplomat, where Pompeo told PLA commander in chief Xi Jinping that the United States was “concerned” about China’s militarization of the waterway. The US and Europe are likely to be important sources of investment for North Korea if the UN Security Council loosens economic sanctions, but it is North Korea’s neighbors in Asia – such as China and South Korea – that will be main external drivers of North Korea’s economic rise. The Global Times recommended Trump “borrow some wisdom from Eastern philosophy” and more closely rely on China for any plans regarding Korean diplomacy.